. Will BMW’s new model be different enough to its larger stablemates the X3 and the X5 to warrant its existence? Serman had one for a week and here’s his report. This is BMW’s latest spin-off; the 1-series SUV, or X1 as it is to be called. It’s squarely targeted at Audi’s Q3 and VW’s Tiquan and is classified as a mid-size SUV. To shed some light on the confusion surrounding BMW’s badge-naming dictionary, we suspect BMW used the 1-series moniker to help matters. It’s based on the current 3-series using many shared parts and built alongside the 1-series coupe at the Liepzig plant, Austria. It’s supposed to offer a more premium feel than Honda or Toyota’s soft-roaders but be as versatile as a full-blown SUV. But with 3-series DNA running through it and the option of rear-wheel-drive, it becomes even more appealing, even against the competition. This is absolutely key to the success of the X1. Unlike the dynamic lines and shape of the bigger X6, the X1, I think, looks fantastic. It still retains the latest BMW sporty but practical exterior ‘form’ from certain angles but it certainly has its own individual personality. Looks aside, step inside and you’re presented with a clean and well placed ergonomically designed cabin. You quickly forget how much influence it has from the 3-series and as far as the ‘whole package’ is concerned, first impressions are very good indeed. Forget the confusing badges and product-placement, this is a serious, premium, mid-size SUV and you quickly get the feeling that the X1 has already succeeded in direct comparison with its rivals in all respects. BMW X1 review – What’s it like, then? Let’s start with build quality. The X3 (also built at the same factory as the X1) was heavily criticised for down-grading the overall build quality, but thankfully fit and finish on the X1 is good with grades of plastics and cabin trim justifying its ‘premium’ tag. 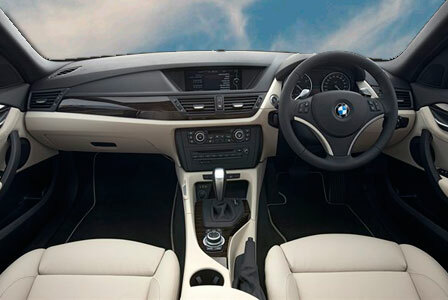 There are soft-feel surfaces across the cabin with a couple of hard plastics thrown in for good measure on the lower centre console but overall it is typical BMW. There are plenty of storage spaces and lots of door pocket room and centre console bins to put keys, pens, loose change, school gear and mobile phones in although there is only one front cup holder as standard – a snap-in additional one on the passenger side as an option, which does feel rather cheap and a somewhat ridiculous idea, especially for this type of car. Ergonomically it’s far superior to the Audi Q3 and VW Tiquan and continues with BMW’s sporty feel the moment you step aboard. The driving position is good and you tend to sit somewhere between the height of a normal saloon and a conventional SUV and surprisingly he X1 seems relatively low, even for a soft-roader. Space in the back is very good indeed but don’t expect 5-series levels of leg-room. If you have teenage kids or younger then the X1 would be a perfect family vehicle and can cart around the daily life with ease. The rear seat backrests are adjustable and split and fold 40/20/40 but the boot is a little on the small side. This can be annoying sometimes, especially when trying to swallow lots of sports bags and the weekend shopping spree, but as the Q3 and Tiquan both suffer from this same problem the X1 hasn’t lost the lead just yet. My test car was an X1 xDrive20d manual, (xDrive is now the new moniker to indicate four-wheel drive whereas rear-drive cars are ‘sDrive’) with the 2.0-litre diesel engine making 174bhp. As with most BMWs, it gets a range of Efficient Dynamics features and returns 51.4mpg on the combined cycle, with a CO2 output of 153g/km. Only go for four-wheel drive if you really need it as it makes the xDrive’s economy, whilst still good for the class, worse than a 2WD X1, which returns 53.3mpg and 139g/km. So what’s it like to drive? The only comparison I can think of is 3-series with a bit more body-roll. The X1 rides on run-flat tyres so it feels jittery over un-smooth tarmac yet it’s mixed with a firm, sporty ride. Comfortable comes to mind though it feels sharper and more balanced than its VW and Audi rivals when you feel like tapping into its sporty nature. Up the speed and it improves greatly, with chassis control well balanced and taught for a tall car, so the X1 turns with great enthusiasm and a fair degree of poise. Its steering is well weighted and feels precise despite running on run-flat tyres which do have a tendency to wipe out any feel. Performance Control, which brakes an inside wheel to cut under steer, is a well worth having as a factory option especially if you’re a keen driver who’ll use the X1 as a daily drive. The engine is pretty smooth and has a broad power band through the gears. It’s punchy enough to overtake without running out of steam half way up and while travelling on motorways its quite enough to enjoy a long journey. Otherwise, there’s a little wind noise around the A-pillars, but overall refinement is very good. BMW X1 review – Should I buy one? I’ve been driving an X1 for a week now and have used it for what it is intended for in the real world – a family car. It ticks all the boxes and has coped far better than I expected. It wasn’t going to be too long before BMW had a rival for VW and Audi and I initially preferred the Tiquan. Having compared all three, the X1 is a more engaging car to drive on a daily basis, but that is a personal opinion. At £25,510 the X1 is well priced in an ever growing segment. It also has lots going for it to tempt new buyers into the showroom. 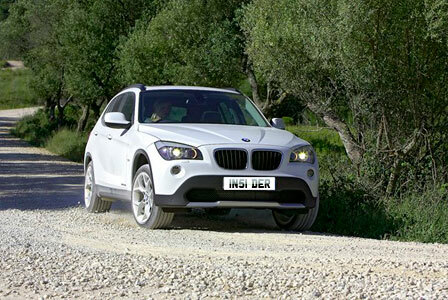 As for existing BMW owners looking for a bigger car or downsizing, the X1 will fit the bill. It may be yet another newly-created BMW model, but don’t dismiss its potential. Volvo get Mayor to change his mind but what’s their car like? I’d buy a Toyota or Honda before I bought a BMW. What sort of honda or toyota? These brands will never have the kudos of a beamer mate!!! Hi Can anyone give me some advice on the X1 size comparisson to the VW Tiquan, I find the Tiquan just a little too cramp and Luggage smape is too small for a family trip. Hoping th eX1 is a little bigger.. Any thaughts ?